It isn’t any mystery how popular bloggers make money. They send 27 different emails to their list of 100,000 subscribers with any old offer they’ve cooked up, and boom! Some of them buy. Or they pop AdSense ads all over their blog, and make thousands a month in affiliate commissions. Unfortunately, it’s not so easy for those of us with a smaller blog audience. We have to go about selling a different way. But small bloggers can earn very well. You don’t need to go massively viral and acquire a giant email list — if you build a close relationship with your audience, and sell products or services that are exactly what they need. I know, because I started earning six figures from my blog back when it had less than two thousand subscribers. I recently reviewed about 100 of my readers’ blogs. Know what I saw, over and over? Tiny, startup blogs with no audience, no comments, no social shares — but covered in advertising. That’s because selling the moment you launch a blog is a bad plan. Selling is not step one in building a blog that earns. It’s down the road. First, you need to envision a focused niche for your blog, where you see other blogs earning well. Once you’ve launched your blog concept, just focus on attracting readers — and getting them to subscribe. Work at that until you have at least 100-200 of them. If you’ve got 300-500, that’s even better. Now, you’re in a position to begin thinking about what you could sell, and figuring out what to charge for it. Now that you’ve attracted some readers who’re interested in your topic, you can take the first essential step toward earning without a huge list: Bond with your readers. Give them free goodies. Send them exclusive emails with useful or inspirational ideas that don’t appear on the blog. Once your readers are raving that you are their go-to source for info on your topic, you can develop something to sell them. How? Start asking questions. One of the advantages of being a small blogger is that you can get closer to your readers than the big guys. If you have an idea for a product or service you think would be useful to your people, don’t assume your idea would be a hit with your audience. Don’t create your offer in a vacuum! Instead, ask readers. Take a poll. Create a question-based blog post. Start a discussion. If they’re local, take a dozen of them out to breakfast to chat (yes, I’ve done that). Find out what they may have already purchased and what they thought of it. Discover what’s missing from the marketplace that they wish they could get their hands on. While you’re at it, ask them how much they’d expect to pay for this item — and do some market research on what other, similar offers cost. Important final question to ask, if you’re developing your own unique offer: How would your people like this delivered? You don’t want to bust your hump creating a video series if they’d prefer PDFs. You may think just a hundred or so subscribers is too small of a sample for this market research to be useful, but in my experience, it’s not. I created a service that earns over $300,000 a year with the data from an 80-person survey. Even with a small sample, you’ll be miles ahead compared with simply guessing at what product or service to create. Gather all your input, refine your idea, and then you’re ready to move forward. Now that you’re no longer fantasizing about what your audience wants and have real data to work with, you can create a first version of your offer. Don’t worry if it doesn’t have every bonus or feature you’d like — just get the fundamentals of it together. Next, recruit beta-testers to try it out. If you’re like me, you’ll get a ton of valuable feedback from that process, and refine/expand/alter your offer based on that input. While all this is going on, you are slyly engaged in preselling your offer. For low-traffic bloggers, preselling is critical. You’re mentioning your offer and describing it, when you recruit volunteers for the beta-test. Maybe you’re posting sample covers of that e-book on Facebook. You can email and let people know how the beta-test is going. You might create a free case study from your course, or a sample chapter of that e-book to give away. More useful preselling. You’re not overtly saying, “Buy something from me” during all this, but you’re educating your audience that a paid offer is coming. The more you do this, the easier the next step will be. Now that you’ve built all this vital groundwork ahead of your sale, selling should be fairly easy. The only trick is not wearing your small subscriber list. Remember those 27 emails I mentioned up top? I never send that many — and most of my subscribers only see a few messages about any particular offer, unless they express some active interest. You can see that with this method, most subscribers don’t get very many emails, and the whole sequence is shorter than what the big bloggers often do. You avoid annoying your readers this way. If you’re still getting a lot of unsubscribes despite segmenting your list during your email sales cycle, there’s one more tactic you can use: Offer them an ‘opt out’ box they can check to not receive any more emails in this sales cycle. Yes, that means they don’t buy now — but it also means they don’t unsubscribe. They stick around and may buy your next offer. If I see one more training about how you’ll never earn well until you have a $10,000 product, I’m going to puke. Price points like that really fail for small-audience blogs. We just don’t have enough prospects, and can’t hit our lists as hard as you need to, in order to sell a pricey offer. Instead, drive volume sales with crazy-low prices on an offer that delivers high value. This has been the whole secret of my success — most of my sales are from products and services that cost $25 or less. 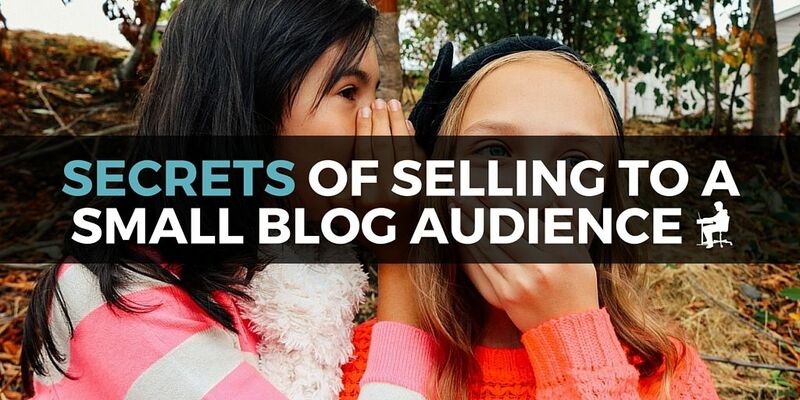 With fewer readers, you need a higher percentage of them to buy than the popular bloggers do. Especially if it’s your first offer, you should be pricing it super-low. Think $1-$5. The point of this first product is just to start people buying, not really to make money. Use this as a ‘previous buyers’ list you can hit harder when you sell the next thing. To sum up, if you haven’t attracted a few hundred subscribers yet, just concentrate on making that happen. Then, involve your readers in creating your offer. Presell it, and then soft-sell it. You shouldn’t have to work harder than that, if your readers were instrumental in creating your product. Carol Tice writes the Make a Living Writing blog. Her new e-book is Small Blog, Big Income: A Niche Blogger's 7-Step Success Formula. Thanks for having me, Kevin! I love this topic, and happy to get this info out there. Thank you Carol for this! I really like the process of the launch, to let people opt-ins several times in a row to avoid annoying them with sales emails they don’t want to hear about. I recently launched my course and only filtered by “Those who opened one of the last 3 campaigns”, which was still about 3/5 of my list. I have a bonus question for you: After you launch, how do you know what went well and what went wrong? For example, how do you know if you need to adjust the price, or the emails, or the positioning, etc.? Great question, Charles! Well, you can certainly see sales rates and email open rates going down often, if you mail on and on. I know, the big guys say people will only buy on email 17 or 23…but you’ll get too many unsubscribes if you hit a small list that hard. Studying what types of subject lines got the most opens and click throughs, what sorts of email messages did well, can really help you tweak for your next campaign. Carol, it sure has been a long time since we spoke! I like how shared the email marketing sequence. A lot of “sellers” don’t know how to effectively sell using email. Nice meeting you here on Kevin’s place. I was on G+ and noticed this and had to come over. I love the way you gave us that email sequence. It is right on target! I use something similar, but need to polish it up and got some great ideas from you. A great big thank you! Also #2 is a great reminder for me. I do need to ask! I think it is overdue. Thanks again…I’ll apply these tips. LOVE, LOVE this post, Carol! The email launch sequence is pure gold. Very eye-opening for a new blogger, thanks Carol! Hi Carol (& Kevin), love your email funnel sequence and point 5! The ‘premium’ course is all the rage right now and there’s so much pressure on new bloggers to deliver a premium product especially when the experts tout it ‘as the way to go’. But I agree that it doesn’t work for new bloggers at all. The first sale is the hardest and it’s a no brainer that some one would buy a $19 vs $399 product if they just got acquainted with you. The super-specific info that you shared — for example, about creating a profitable product by surveying just 80 people — was great. I’ve been wondering how many subscribers is ‘enough’ to actually start on this crowd-sourcing process. Another bit of gold was your email sequence details, right down to the nitty-gritty of who gets what mail. I’ll be referring to this in the next 3 -6 months, I hope! Hmm…I don’t know how super-organized I am on beta-testing! But one thing we usually do is create forums testers can post on, including one named ‘Report Problems’ or “Suggestion Box” and one that’s “Share Your Takeaways,” so we see what was most useful in the course. Both of those give us suggestions for improvement. Patti…you just DID write in public, on this blog comment! Really, no lives are at risk — just push ‘Publish’ and get rolling! For me, it was about posture. I feared asking my – at the time – super small audience to buy stuff from me. Felt weird posting ads. Turns out, when I got clear on my offerings and blog, money responded to my clarity. I did the inner work. I clearly asked my readers to follow specific calls to action. They followed. I boosted my income. Having a relatively smaller audience, many bloggers are terrified to lose ’em, or, to peeve them off, by asking them to buy stuff. I took a different approach; I saw each reader as a raving fan, and goodness knows, as I got clear on this belief I attracted more readers, more buying readers and more raving fans. Signing off from not 1 bit sunny NJ. Sorry about the weather, Ryan! And great to see you on here. I’m just creating a big post for Mirasee on affiliate selling when you have a small audience…and the principles are all the same. Figure out what your audience really needs, and they won’t be mad at you for offering it! Carol, what great advice. I know I don’t like visiting a blog that is full or ads whether they are a beginner or not! I expect content, content and more content. Even the email blasts that many bloggers send out, I do not like those that only send out sales pitches, webinars after webinars, etc. Mix it up! I think Adrienne Smith or Sue Dunlevie do a great job with theirs. I like that you tell us the # to hit too with the emails before trying to sell anything. Thanks for these tips! Nice to meet you on Kevin’s awesome blog. Carol, I didn’t notice that you were the author until I got to the end of the article. I kept thinking, “wow, this is such great advice!” Then I realized it was you and it all made sense. Thanks for writing — solid tips here. Especially the low pricing first to get those initial buys! She said, “Well, I need to launch it because I need an income stream.” Well guess what? With 400 subscribers, you’re going to get maybe 4 sales with a lack of a low-priced tripwire and just throwing this out there. It won’t provide an income stream without following the steps that make it easy to sell, and it will lead to massive unsubscribes. Fortunately, she saw the light and has now beta-tested and is launching with testimonials and feedback under her belt — I’m confident it’ll be more successful and easier to sell. Thanks for the info Carol. I just started my first attempt at blogging a couple of weeks back. Enjoying putting my stuff out there, and starting to get more views as times go on. Hopefully, it will translate into more subscribers as time goes on. Just trying to focus on quality content mostly at this point. In terms of your email strategy, what program do you use to handle your emails to subscribers? Neil, I use and love Mailchimp. It’s free for the first 2,000 subscribers, so it’s a great place to get started, and it makes forms and emails look great easily. What I really like was the analysis for each and every mail and sending the next email in accordance with that. This will greatly affect your amount of work done and you will get the target audience ready for buying your product as well..!!! I will follow this strategy in my upcoming email marketing campaign..!! Thanks for the guidance. Awesome stuff shared in the most awesome way.. Earning six figures from a list of less than two thousand subscribers proves you are an authority on the subject. In the very beginning, I had ads on my site as well. I just didn’t know any better. Even worse, I even hated them myself! I love the idea of reaching out to my audience about an offer idea. I’ve played around with multiple product ideas for quite a while. If my list is receptive to one of the ideas, I’d definitely create it. Glad to hear you think the same way about high-ticket products. Ramit Sethi has a whole team working on products, so it’s simply not the same if you are a solopreneur. Some of these products or courses are great, but if you don’t have an established name like Frank Kern, it’s going to be a tough sell. The one thing that keeps on coming back in my mind is creating a series of low priced products that show readers how to tackle specific problems about writing copy. Perhaps it’s time to ask my list how they think about that! We can always come up with a product to sell and hope it works, but if you ask your readers it takes out the guess work (more sales, since you did research). All your really doing is asking what the readers want, and giving it to them for a price. Thanks for the insights Carol. My pleasure, Benjamin. And yes, it’s a simple system. Ask your readers what they need from you. Develop it. Let them know it’s ready. No surprise, they buy it. It’s a lot easier and more successful system than sitting at home guessing at what you THINK readers MIGHT buy…and then wondering what went wrong when it doesn’t work out. But it’s amazing how many bloggers don’t ask readers or involve them in their development process. Hi Carol. I like your soft-sell approach by including your readers in the process from the very beginning. I don’t see that very much and I think it is a great idea. Thanks for sharing it. I love how you used actual, first-hand accounts and evidence of how these strategies have worked for you in the past. Excellent post!